GrADS-aholic! : Script: Boxplot.gs; Make Box Plots from user-input data. Script: Boxplot.gs; Make Box Plots from user-input data. I wrote this script after I finished the script statpack.gs since most of the heavy lifting was already finished. Boxplot takes data from a user input array in the form of a string with array elements separated by spaces (same as scatter.gs) and plots out a box plot using that data. To use this script, no outside file is required. It is written such that an unspecified number of box plots can be plotted on the same plot. In most cases, this type of analysis is best left to other plotting software, but this script may be of some use in certain cases. Example usage: Hail Reports between 1995 and 2006. 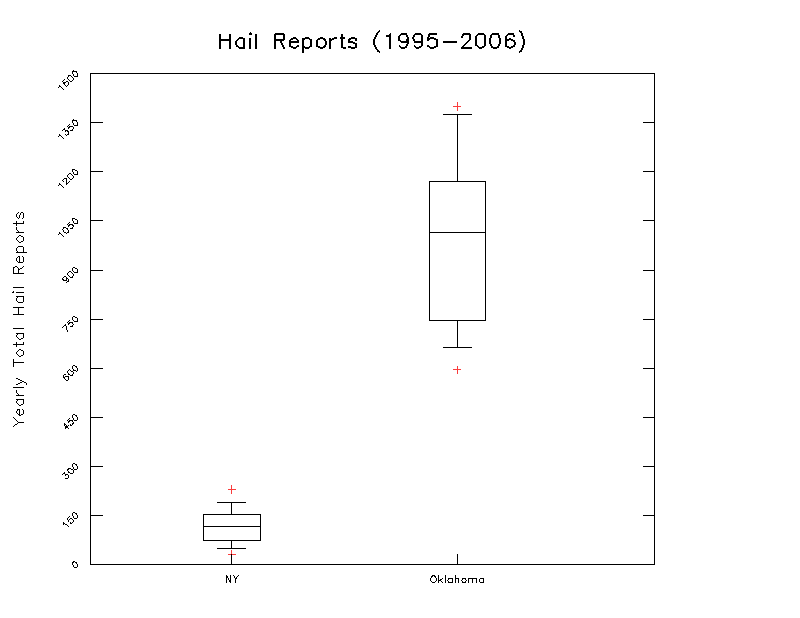 Example of Boxplot.gs output: Hail Reports. This example is for the number of small hail reports in New York and Oklahoma. As you can gather from the above example, this script takes a whole bunch of arguments, all are listed in a help section and can be set at the top of boxplot.gs. I had other examples to present involving climatology data, but the government shutdown has made accessing this data a bit frustrating, so that has been tabled for now. For more information on how to populate an array from data contained in a GrADS .ctl file, check out the example on scatter.gs. This script can process as many arrays as you specify, as long as each array is preceded by a "-d"
Unlike scatter.gs I did not spend a lot of time on "anti-clipping", so if you specify your data-axis (rather than leaving it on auto) you may find your data exceeding your boundaries. The data represents the inner-quartile-range, the median, and the lines extend to the 10th and the 90th percentile [calculated using the formula used by MS Excel - q=p*(n-1)+1]. If you turn on title plotting (-title) in your arguments, you will be prompted to enter your title, so be sure to keep an eye on your console for instructions. Hopefully you find this script useful, this is v1.0 so be on the lookout for bugs, I have tested most of the options and I can't see any bugs as of now, but if you find some, please report them here! I am trying to generate percentile information spatially (on a map) with a set of gridded data. For example, say I have 10 different sets of forecast data valid at the same times. How can I calculate and display (on a map) the 10th, 50th, 90th etc percentile of the value of a given variable (say temperature) at each gridpoint for a given time? Thanks for any suggestions you might have. This is a lot more tricky, the way the above script works is by just taking an array of numbers and doing a calculation on the array of numbers without affecting any of the gridded data in the binary/netcdf file. So the best way to do this, would be to use another coding program, say fortran and do the percentile analysis at each grid point, and then save that data into a netCDF file, with a control file. Then you could plot that up in GrADS no problem. Also, google it, there might be something out there that someone else has figured out how to do the percentile analysis with the gridded data, perhaps a UDF or something that you might be able to work with. Unfortunately, I do not have any good suggestions other than using a program outside of GrADS to do the analysis. Thanks for the feedback. I have found some info on how it could be done with PyGrADS, but wanted to see if it could be done directly in GrADS before looking into that (since it requires installing OpenGrADS and PyGrADS). But, I guess I'll investigate that option. Thanks again.